The émeraude City. A view of the émeraude city. 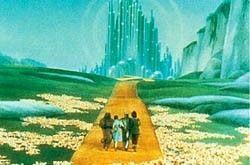 Wallpaper and background images in the Le Magicien d’Oz club tagged: the wizard of oz classic film judy garland musical emerald city image. This Le Magicien d’Oz photo might contain resort, hôtel, station de vacances, station, hôtel de vacances, resort hôtel, lieu de villégiature, coucher du soleil, lever de soleil, coucher de soleil, and lever du soleil.